Your favourite pizza-loving turtles Michaelangelo, Donatello, Leonardo and Raphael are back in the non-stop action adventure that is "fun from start to finish." After super villain Shredder escapes custody, he joins forces with two mutant henchmen, Bebop and Rocksteady, to unleash a diabolical plan to take over the world. Now the brothers must team up with April O'Neil and their new, hockey-masked ally Casey Jones to battle their enemie..
Own TMNT - Teenage Mutant Ninja Turtles - Out Of The Shadows DVD from Deff, DVD, Blu-Ray & 4K Video Specialists - Free UK Delivery.. They're Back...and they're ready to kick some shell! COWABUNGA! The heroes in a half shell are back and they are meaner, greener and with more attitude than ever before! In this all new hit CGI movie, Leonardo, Raphael, Michelangelo and Donatello battle an army of old foes and ancient monsters to save New York and the World! (With a little help from Splinter, April O'Neil and Casey Jones along the way!) Its time to apply some Turtle wha..
Teenage Mutant Ninja Turtles: The Teenage Mutant Ninja Turtles are bigger and better than ever in this blockbuster hit loaded with non-stop action and laughs! When New York City is in trouble, it’s up to these four ninja-fighting, pizza-loving brothers to save it. Aided by determined reporter April O’Neil (Megan Fox) and their wise master Splinter, these unlikely heroes must face their ultimate nemesis – the evil Shredder. Out Of The Sh.. The Teenage Mutant Ninja Turtles are bigger and better than ever in the blockbuster hit loaded with non-stop action and laughs! When New York City is in trouble, it's up to these four ninja-fighting, pizza loving brothers to save it. Aided by determined reporter April O'Neil (Megan Fox) and their wise master splinter, these unlikely heroes must face their ultimate nemesis - the evil Shredder. Special Features Digital Reality, In Your F..
Teenage Mutant Ninja Turtles The Original Movie: For years Michaelangelo, Leonardo, Donatello and Raphael have lived deep in the sewers of New York, learning the art of Ninja from their master, Splinter. But when a massive crime wave sweeps the city, the man-sized, pizza-eating Teenage Mutant Ninja Turtles join forces with reporter April O'Neil and vigilante Casey Jones to combat the corrupt gang of criminals and their mysterious leade..
Own TMNT Teenage Mutant Ninja Turtles - Best Of Donatello DVD from Deff, DVD, Blu-Ray & 4K Video Specialists - Free UK Delivery..
Own TMNT Teenage Mutant Ninja Turtles - Best Of Leonardo DVD from Deff, DVD, Blu-Ray & 4K Video Specialists - Free UK Delivery..
Own TMNT Teenage Mutant Ninja Turtles - Best Of Michelangelo DVD from Deff, DVD, Blu-Ray & 4K Video Specialists - Free UK Delivery..
Own TMNT Teenage Mutant Ninja Turtles - Best Of Raphael DVD from Deff, DVD, Blu-Ray & 4K Video Specialists - Free UK Delivery..
Own TMNT Teenage Mutant Ninja Turtles - Gaming Mug from Deff, DVD, Blu-Ray & 4K Video Specialists - Free UK Delivery..
Own TMNT Teenage Mutant Ninja Turtles - Man-Hole Mug from Deff, DVD, Blu-Ray & 4K Video Specialists - Free UK Delivery.. Your favourite pizza-loving turtles Michelangelo, Donatello, Leonardo and Raphael are back in the non-stop action adventure that is "fun from start to finish." After super villain Shredder escapes custody, he joins forces with two mutant henchmen, Bebop and Rocksteady, to unleash a diabolical plan to take over the world. Now the brothers must team up with April O'Neil and their new, hockey-masked ally Casey Jones to battle their enemies..
Own TMNT Teenage Mutant Ninja Turtles - Out Of The Shadows Mug from Deff, DVD, Blu-Ray & 4K Video Specialists - Free UK Delivery..
Own TMNT Teenage Mutant Ninja Turtles - Retro Logo Mug from Deff, DVD, Blu-Ray & 4K Video Specialists - Free UK Delivery.. Emerging from their hidden lair in the sewers for the very first time, the Teenage Mutant Ninja Turtles are ready to explore the hostile streets of NYC. Join these four super dudes – Leonardo, Donatello, Raphael, and Michelangelo – as they face enemies more dangerous (and taste pizza more delicious) than anything they could have imagined! Includes: Rise Of The Turtles (double-length episode), Turtle temper, New friend. Old enemy, I thin..
Now you can catch everyone's favourite green teens in their first live action blockbuster film in this turtle-ly bodacious, full length movie! After wading in a puddle of radioactive waste, these radical reptiles are transformed into New York City's greatest crime fighting quartet. Featuring a soundtrack by M.C Hammer, this film will captivate adults and kids alike with its blend of humour, camaraderie and martial arts action. On its or..
Own TMNT Teenage Mutant Ninja Turtles - Turtles Forever DVD from Deff, DVD, Blu-Ray & 4K Video Specialists - Free UK Delivery.. Prepare for nonstop ninja action... as the Turtles go from escaping the mind control of a parasitic wasp to escaping a Kraang detention facility, leading up to their biggest showdown in a 2-part finale you won't want to miss! Includes: Karai's Vendetta The Pulverizer Returns! Parasitica Operation: Break Out! Showdown (Double-Length Episode) Special Features Comic Book: Tales From The Turtle Lair, Part Five, Comic Book: Tales From The ..
Own Teenage Mutant Ninja Turtles - Movie Collection DVD from Deff, DVD, Blu-Ray & 4K Video Specialists - Free UK Delivery..
Own Teenage Mutant Ninja Turtles - Original Movie DVD from Deff, DVD, Blu-Ray & 4K Video Specialists - Free UK Delivery..
Own Teenage Mutant Ninja Turtles 4K Ultra HD from Deff, DVD, Blu-Ray & 4K Video Specialists - Free UK Delivery..
Feature-length special of the animated series 'Teenage Mutant Ninja Turtles', featuring the voices of Seth Green, Sean Astin, Greg Cipes and Rob Paulsen. The ninja turtles and the troublesome Bebop (J.B. Smoove) and Rocksteady (Fred Tatasciore) are transported to the Cretaceous age of the dinosaurs when they are struck by a strange meteorite. 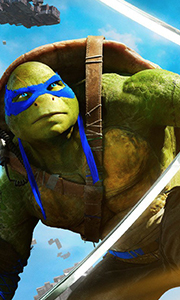 Faced with the challenge of getting home, Donatello (Paulsen), Leonardo (Green), Michelangelo (..
Sequel to the big-budget reboot of the comic book series following the anthropomorphic ninjutsu-trained turtles Leonardo (Pete Ploszek), Michelangelo (Noel Fisher), Donatello (Jeremy Howard) and Raphael (Alan Ritchson). The turtle's arch nemesis Shredder (Brian Tee) has returned and employed Techno Cosmic Research Institute scientist Dr. Stockman (Tyler Perry) to create some mutants of his own in the form of ferocious duo Bebop (Gary An..
Own TMNT Teenage Mutant Ninja Turtles (2 Films) 1 to 2 Movie Collection DVD from Deff, DVD, Blu-Ray & 4K Video Specialists - Free UK Delivery..
Teenage Mutant Ninja Turtles The Original Movie: For years Michaelangelo, Leonardo, Donatello and Raphael have lived deep in the sewers of New York, learning the art of Ninja from their master, Splinter. But when a massive crime wave sweeps the city, the man-sized, pizza eating Teenage Mutant Ninja Turtles join forces with reporter April O'Neil and vigilante Casey Jones to combat the corrupt gang of criminals and their mysterious leader.. Beyond the Universe: The Triceratons have destroyed earth. Everyone is gone, including Master Splinter. But the Turtles were saved at the last minute by the Fugitoid. Now, they must travel back in time, and through outer space, to find the three pieces of the Black Hole Generator used by the Triceratons in order to save the world! Episodes: Beyond The Known Universe, The Moons Of Thalos 3, The Weird World Of Wyrm, The Outlaw Armaggon, R..
Own TMNT Teenage Mutant Ninja Turtles - Cowabunga Classics DVD from Deff, DVD, Blu-Ray & 4K Video Specialists - Free UK Delivery..
Own TMNT Teenage Mutant Ninja Turtles - Earths Last Stand And Super Shredder DVD from Deff, DVD, Blu-Ray & 4K Video Specialists - Free UK Delivery..
Join Leo, Donnie, Ralph, and Mikey as they take to the streets of NYC, where every turn yields a new enemy. Get ready for non-stop battles against Kraang-droids, mechanical Mousers, a mutant alligator, and even the evil Shredder himself. Includes: Monkey Brains Never Say Xever The Gauntlet Panic In The Sewers Mousers Attack! It Came From the Depths New Girl In Town Special Features Comic Book - Tales From The Turtle Lair.. The Turtles discover the secret headquarters of the alien invaders, and as they take on the Kraang, they'll also face off against new enemies and old - including the Rat King, Cockroach Terminator and Baxter Stockman, who seeks revenge once and for all. Includes: I. Monster The Alien Agenda The Pulverizer TCRI Cockroach Terminator Baxter's Gambit Enemy Of My Enemy Special Features Comic Book - Tales From The Turtle Lair. Part Three, Co..
Own TMNT Teenage Mutant Ninja Turtles - Monsters and Mutants DVD from Deff, DVD, Blu-Ray & 4K Video Specialists - Free UK Delivery.. It's total trouble in Season Two whe the Turtles accidentally drop 63 canisters of mutagen all over NYC! As they scour the city to locate and recover them, they're already too late, as new threats and mutated villains emerge! Includes: The Mutation Situation Follow The Leader Invasion Of The Squirrelanoids Mutagen Man Unleashed Mikey gets Shellacne Special Features Ninjas In New York, Channel 6 News, Special Report: Creatures Of The N..
Casey Jones Steps Up and takes on pure evil. Meanwhile, the Turtles learn a shocking secret about April’s past, and they come face-to-face with another mutant turtle called Slash, a rewired Metalhead, a fungus mutant spreading through the sewers, and the Rat King! Includes: Target: April O'Neil Slash And Destroy The Kraang Conspiracy The Good, The Bad, And Casey Jones Fungus Humungous Metalhead Rewired Of Rats And Men.. Double bill of big-budget action adventures following the anthropomorphic ninjutsu-trained turtles as they battle to keep New York safe. In 'Teenage Mutant Ninja Turtles' (2014), Leonardo (Pete Ploszek/voice of Johnny Knoxville), Michaelangelo (Noel Fisher), Donatello (Jeremy Howard) and Raphael (Alan Ritchson) take on arch nemesis Shredder (Tohoru Masamune) and his Foot Clan as they threaten to take control of the city. Meanwhile, Apri.. The last 13 episodes from the third season of the children's CGI-animated cartoon tracing the origins of the sewer-dwelling, superhero foursome Leonardo, Donatello, Raphael and Michelangelo. The episodes are: 'Casey Jones Vs the Underworld', 'The Noxious Avenger', 'Clash of the Mutanimals', 'Meet Mondo Gecko', 'The Deadly Venom', 'Turtles in Time', 'Tale of the Yokai', 'Attack of the Mega Shredder! ', 'The Creeping Doom', 'The Fourfold T..
Own TMNT Teenage Mutant Ninja Turtles - Renegade / Into Dimension X DVD from Deff, DVD, Blu-Ray & 4K Video Specialists - Free UK Delivery..
Own TMNT Teenage Mutant Ninja Turtles - Retreat! DVD from Deff, DVD, Blu-Ray & 4K Video Specialists - Free UK Delivery..
Own TMNT Teenage Mutant Ninja Turtles - Return To NYC DVD from Deff, DVD, Blu-Ray & 4K Video Specialists - Free UK Delivery..
Own TMNT Teenage Mutant Ninja Turtles - The Original Movie DVD from Deff, DVD, Blu-Ray & 4K Video Specialists - Free UK Delivery..
Own TMNT Teenage Mutant Ninja Turtles - Wanted Bebop And Rocksteady DVD from Deff, DVD, Blu-Ray & 4K Video Specialists - Free UK Delivery..
Meet the Teenage Mutant Ninja Turtles, Leonardo, Donatello, Michelangelo and Raphael. The most amazing reptiles in the universe, who were once regular pet shop turtles until an accident sent them into the city sewer and mutant goo transforms them into a crime-fighting foursome! Fighting for good against the evil Shredder and his terrifying Technodrome, these pizza-eating heroes are a funny, phenomenal team. Cowabunga Dudes! 3 Awesome O.. The Teenage Mutant Ninja Turtles are bigger and better than ever in this blockbuster hit loaded with non-stop action and laughs! When New York City is in trouble, it’s up to these four ninja-fighting, pizza-loving brothers to save it. Aided by determined reporter April O’Neil (Megan Fox) and their wise master Splinter, these unlikely heroes must face their ultimate nemesis – the evil Shredder. Special Features Digital reality, It Ain't..
Own TMNT Teenage Mutant Ninja Turtles II - The Secret Of The Ooze DVD from Deff, DVD, Blu-Ray & 4K Video Specialists - Free UK Delivery..
Own TMNT Teenage Mutant Ninja Turtles III - Turtles In Time DVD from Deff, DVD, Blu-Ray & 4K Video Specialists - Free UK Delivery.. Breathing new life into the iconic characters of this wildly popular franchise, Nickelodeon transforms the cowabunga craze into epic booyakasha battles! Enjoy all 26 episodes from the first season of this exciting CG-animated action-comedy series! Straight from the sewers, the Teenage Mutant Ninja Turtles enter NYC and face forces of evil beyond their imagination. Join the four crime fighting brothers Leonardo, Raphael, Donatello and Mi.. It's Lean, Mean, Green Action...as The Turtles take on new threats and mutated villains including Slash, a rewired Metalhead, and Shredder's deadly new assassin. And get ready for more epic showdowns as the brothers enter the bizarre realm of Division X and ultimately try to stop the Kraang invasion!.. Get ready to yell ‘Cowabunga Dudes’ once again as the most awesome reptiles in the universe, The Teenage Mutant Ninja Turtles, ‘raise shell’ for their 25th anniversary. You remember the story; Leonardo, Donatello, Michelangelo and Raphael were once regular pet shop turtles until an accident hurtled them into the city sewer and mutant goo transformed them into a totally awesome foursome! Fighting for good against the evil Shredder and hi..